World Review was a magazine in the Hulton group of publications. The better known and better selling group titles were Picture Post, which specialised in photographic reporting in the same style as Life in the USA, and Lilliput, a digest-sized magazine known for its fiction. It was in turn the latest avatar of the Victorian Review of Reviews. Orwell first referred to World Review when he drew attention to its articles on the Yugoslav anti-Nazi leader Mihailovich. The first two in a series were written by R. V. Elson: ‘I invite attention to an article entitled “The Truth about Mihailovich?” (the author of it also writes for Tribune, by the way) in the current World Review. It deals with the campaign in the British press and the B.B.C. to brand Mihailovich as a German agent. ‘Jugoslav politics are very complicated and I make no pretence of being an expert on them. For all I know it was entirely right on the part of Britain as well as the U.S.S.R. to drop Mihailovich and support Tito. But what interests me is the readiness, once this decision had been taken, of reputable British newspapers to connive at what amounted to forgery in order to discredit the man whom they had been backing a few months earlier. There is no doubt that this happened. The author of the article gives details of one out of a number of instances in which material facts were suppressed in the most impudent way. Presented with very strong evidence to show that Mihailovich was not a German agent, the majority of our newspapers simply refused to print it, while repeating the charges of treachery just as before’ (‘As I Please;, 12 January 1945). These images from the January 1945 issue of World Review are linked from the Pogledi website which details the life of General Draza Mihailovic. It contains Elson’s two articles and further articles on the General by other contributors. Edward Hulton, the proprietor of a large publishing group, is described as the editor. He was politically conservative, which might explain why an author such as Peter Drucker, whom George Orwell regarded as being on the extreme right, is another contributor. It also exemplifies the contingent politics of the period – Tito in Yugoslavia, rival to Mihailovich, was still aligned with Stalin at this time – and most likely Elson could not place his analysis in any of the liberal press. At the end of the Second World War the editorship of World Review passed to Stefan Schimanski, a journalist who had earlier managed to escape to Britain from the Nazis. Hulton employed several expatriate journalists; for instance Stefan Lorant was the co-founder of Picture Post. Schimanski was an acquaintance if not friend of Orwell, and during his earlier employment in publishing he had attempted to publish Orwell’s war-time journals, though without success. In 1947 with his co-editor Henry Treece he published an anthology of war-time diary entries Leaves In The Storm – without Orwell’s contribution again, unfortunately, but it is the volume which includes Inez Holden’s memoir of seeing ‘George’ going home every lunchtime to wheel away his library from his bombed-out flat. By examining how one issue of World Review dealt with one of Orwell’s subjects one can see the political slant it had maintained from Hulton’s editorship. In January and February 1946 Orwell published a series of analytical articles (in the Manchester Evening News) on the current political situation under the general title The Intellectual Revolt. In his third column ‘The Christian Reformers’ (MEN 7th February 1949) he discussed the Russian emigre Nicholas Berdyaev: ‘He left Russia at the time of the Revolution, but though hostile to Bolshevism, he has written of it with more understanding and respect than most of its opponents’. Berdyaev was part of a group, according to Orwell, who ‘would admit that if the Church has lost the support of the masses it is largely by tolerating injustice’ (reprinted in Orwell And Politics, edited by Peter Davison, 2001). Berdyaev died in 1948 and, a year later, his last work ‘Political Testament’ was published in the March 1949 issue of World Review. The Berdyaev website has made that article, along with with scans of the cover and the contents page of the issue in which it appeared, available online. One can appreciate the variety of contents and the general intellectual level of the magazine. In May 1949 Schimanski finally published Orwell in World Review. Unfortunately, the arrangement seems to have been made without Orwell being aware: an article appeared: ‘1984 and Newspeak’. It was not an article, though, but the Appendix on Newspeak from Nineteen Eighty-Four and contained no lede or explanation of its appearance. Orwell was not happy. 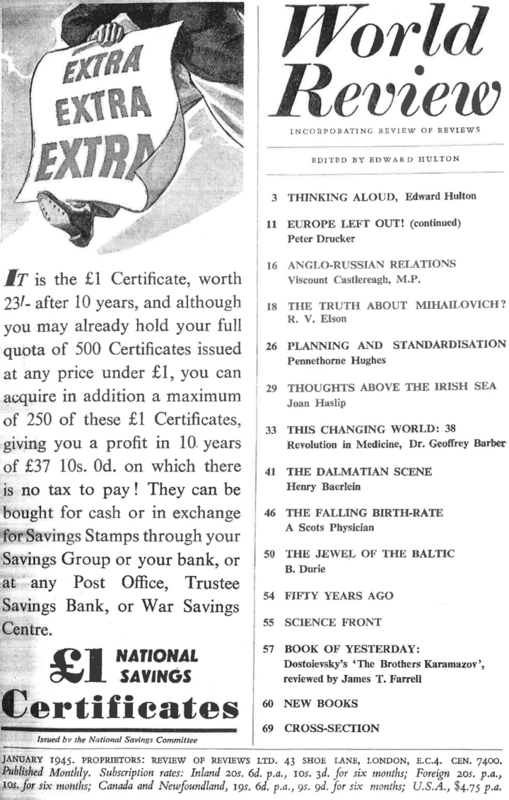 Nineteen Eighty-Four appeared in July 1949 (World Review‘s note had said it would appear in June – perhaps another indication of problems at Secker and Warburg. Orwell’s publisher; someone there must have passed the Appendix to Schimanski). Orwell, though, was in hospital, unable to keep up his administration, and while he was planning to go to Switzerland to recuperate he died in January 1950. Orwell’s will made his long-term friend Sir Richard Rees his literary executor, and in June 1950 a special edition of the magazine appeared; with contributions from authors who had known and worked with him, and finally – described as his notebooks – his war-time diary. The battered condition of the individual copy of that issue shown here gives some idea of the importance it had for those who wanted to read everything possible of and by George Orwell. Not only is this copy well-thumbed, but its former possessor seems to have lent it out with his return address shown on the contents page, as if this was a library copy. According to the memoirs of Tom Hopkinson, who succeeded Stefan Lorant as editor of Picture Post, a whole issue of his flagship magazine dedicated to a radical such as George Orwell was too much for Edward Hulton and he quickly closed World Review. How radical the magazine had become is difficult to make out: not very to go by the previous issue, May 1950, which contained James (anti-communist; former Trotskyist; anti-Orwellian?) Burnham on ‘The Defeat of Communism’. Picture Post itself suffered from editorial interference and lost influence and readership, before closing in 1959. 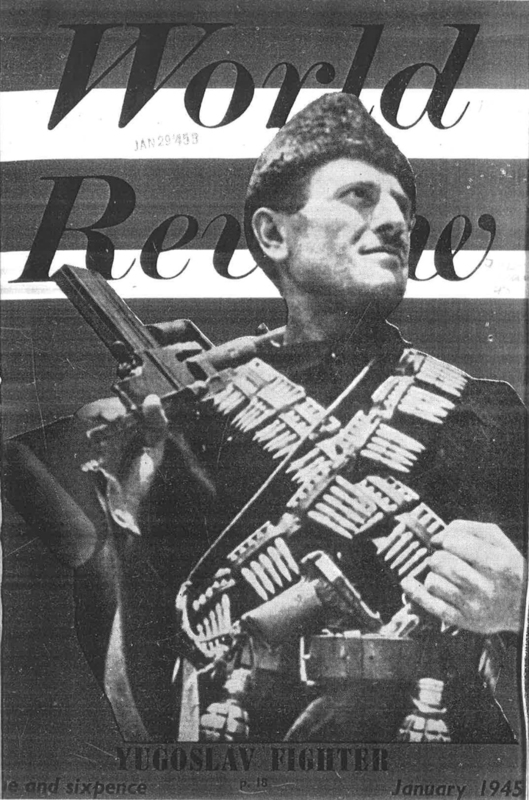 Hulton turned to the promotion of European integration, calling a successor magazine Europe Review, while Hopkinson went to South Africa and founded Drum, the photo-magazine which recorded the coming – despite its best efforts – of apartheid. We hope to write more the relationship of George Orwell and Stefan Schimanski on this website, for Schimanski, clearly, was one of the early figures who kept the flame of Orwell burning.